This trap features a fully enclosed dog proof design with powerful springs, sensitive pull-type trigger, and a straight spade staking system. Extremely efficient and safe to set and check on the trap line or in town. Pull-Type trigger design excludes catching of most non-target animals. Bait trigger with a large marshmallow using corn syrup, anise oil or fish oil, or raccoon bait as an attractant. Features include: heavy duty machine chain with swivels attached, heavy duty coil springs and trigger system, and foot hold restraining devices used to catch and hold wild. 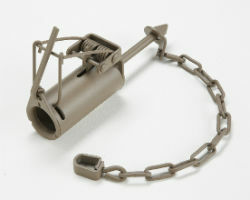 Comes equipped with stake attached directly to bottom of trap. This trap is a cost effective and efficient tool for managing wildlife populations. Simply set the trap, stake the chain, and stick the stabilizer stake in the ground at 45 degree angle.